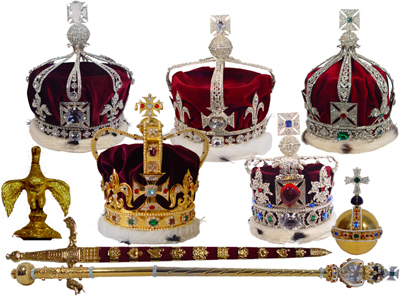 CROWN JEWELS is the traditional English term for the elements in metalwork or jewellery of the royal regalia of a particular state. They are often only used for the coronation of a monarch and a few other ceremonial occasions, though the monarch may also be often shown wearing them in portraits, as they symbolize the power and continuity of the monarchy. 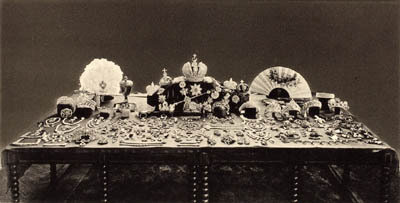 Though additions to them may be made, since medieval times the existing items are typically passed down unchanged as they symbolize the continuity of the monarchy. 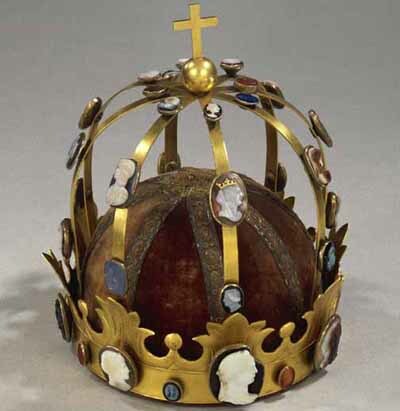 Typical items in Europe include crowns, sceptres, orbs, swords, rings, all usually in gold and heavily decorated with jewels, in styles which go back to the Middle Ages and are normally very conservative to emphasize the continuity of the monarchy. 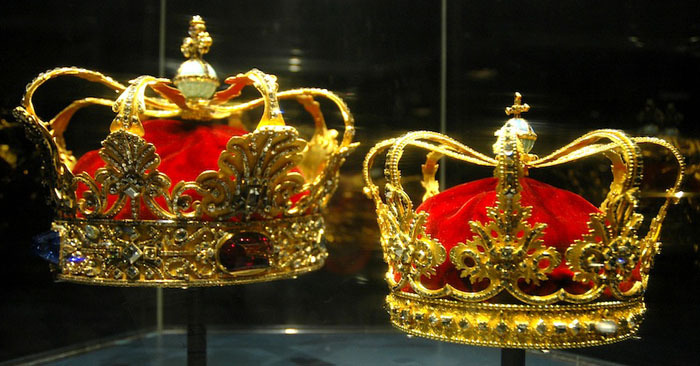 Many crown jewels are kept in a museum setting except when in use, and can be seen by the public. 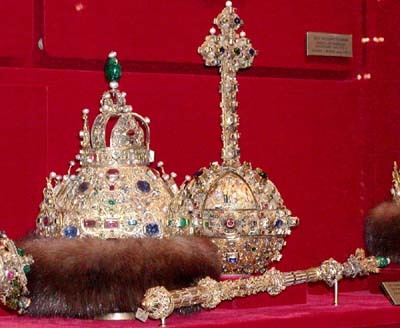 The crown jewels of many former monarchies can also be seen in museums, and may still represent national cultural icons even for countries that are now republics, as for example in Hungary, where the Holy Crown of Hungary has been re-incorporated in the coat of arms of Hungary. 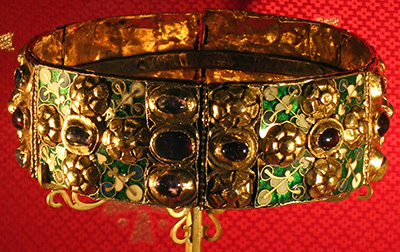 Several countries outside Europe have crown jewels that are either in traditional forms for the country, or a synthesis of European and local forms and styles. 6 Best Jewels of New York Fashion Week - The New York Times. 10 Most Expensive Pieces Of Jewelry Ever Sold At Auction - Business Insider. 12 spectacular pink diamond engagement rings - "Inspired by the Pink Star diamond?" 26 Firsts from Boucheron - "Redefining luxury." 26 things you didn’t know about Maison Boucheron. 30 Christmas gifts for jewellery lovers - The Telegraph. $150 million of bling: how Cartier recreated a 1930s masterpiece for Ocean’s 8 - The Telegraph. Affair of the Diamond Necklace - incident in 1785 at the court of King Louis XVI of France involving his wife, Queen Marie Antoinette. The reputation of the Queen, already tarnished by gossip, was ruined by the implication that she participated in a crime to defraud the crown jewelers of the cost of a very expensive diamond necklace. The Affair is historically significant as one of the events that led to the French populace's disillusionment with the monarchy, which, among other causes, eventually precipitated the French Revolution. ALL ABOUT GEMSTONES - a diamond, colored-gemstone and jewelry database/website that was written from a layperson's perspective, and is designed to bridge the gap between the expert gemologist. Andrew Grima, jeweller to Hollywood & royalty - The Telegraph. Bella Hadid lets her necklace do the talking - The Telegraph. best jewellery at the Cannes Film Festival through the ages - The Telegraph. Bezel - the bezel of a ring is a wider and usually thicker section of the hoop, which may contain a flat surface, usually with an engraved design, as in a signet ring, or a gem. Bulgari and the Era of the Global Jeweler - The New York Times. Cabochon - gemstone which has been shaped and polished as opposed to faceted. CARTIER S.A. - the company has a long and distinguished history of serving royalty, as well as stars and celebities. One Prince of Wales hailed Cartier as "Joaillier des Rois, Roi des Joailliers" ("Jeweller to Kings, King of Jewellers"). Cartier’s Coloratura high jewellery is a celebration of diversity & colour - The Telegraph. Collier d'esclavage - Objets d'hier. Custom Jewelry, Mini Size - The New York Times. DAVID EDEN - expensive eye glasses with diamonds, rubies and sapphires. 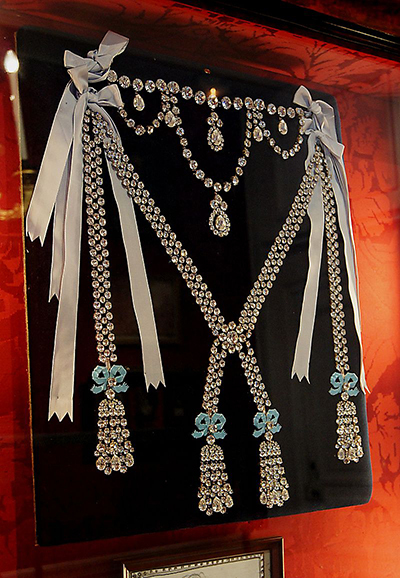 Diamond Fund of Russia - dates back to the time of Peter I. A collection of masterpieces of jewelry of the 18th-20th centuries, rare precious stones, gold and platinum nuggets of great historic, artistic and scientific importance, as well as vast material value. Diamond.net - "Diamond Prices, Rapaport News and Information." Dior À Versailles CÔtÉs Jardins - "A magical stroll around the gardens of Versailles." 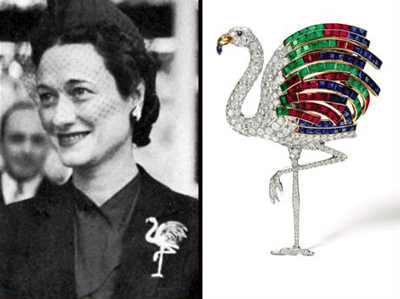 duchess of windsor jewels - sold at Sotheby's Geneva auction on April 2 and 3, 1987. 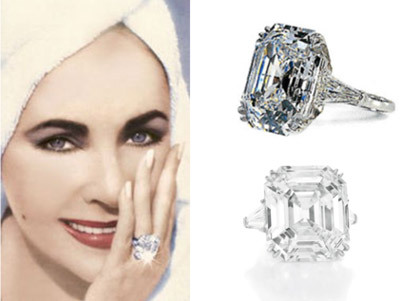 Elizabeth Taylor's £100m collection of gems, gowns and art goes on display at Christie's - Daily Mail. Elsa Peretti - jewelry designer, philanthropist & former fashion model. Facet - flat faces on geometric shapes. Gemstones commonly have facets cut into them in order to improve their appearance by allowing them to reflect light. Fibula - definition & explanation. Garnet - group of silicate minerals that have been used since the Bronze Age as gemstones and abrasives. GEM - definition & explanation. GRAFF DIAMONDS ROBBERY - Wikipedia. Harry Winston unveils the Legacy jewellery collection - "A high jewellery love letter to the King of Diamonds." HOUSE OF FABERGÉ - Wikipedia. House of Faberge: The story behind the world's most luxurious eggs - CNN style. How vintage jewellery brings old-time glamour to the red carpet - The Telegraph. IBM is using blockchain to confirm the origins of jewelry - engadget. If you like vibrating jewelry, put a Ringly on it - engadget. Ilias Lalaounis Jewelry Museum - founded in 1993. Athens, Greece. Inside La Pausa: Coco Chanel's Côte d'Azur hideaway that inspired the new high jewellery collection - The Telegraph. Inside Princess Diana's jewellery collection - The Telegraph. JCK Magzine - "Jewelry Industri News, Trands, and Analysis." Jewelers of America - "The resource for the professional jewelry industry." JEWELLERY MUSEUMS IN EUROPE - The Society of Jewellery Historians. JEWELLERY MUSEUMS IN UK - The Society of Jewellery Historians. Jewels du Jour - "Your Daily Dose of Jewelry." Kenneth Jay Lane, Jewelry Designer Who Made a Fortune Faking It, Dies at 85 - The New York Times. largest ever private collection of Grima jewellery - The Telegraph. LIFE GEM - is a certified, high-quality diamond created from the carbon of your loved one as a memorial to their unique life. List of jewellery designers - Wikipedia. List of jewellery types - Wikipedia. 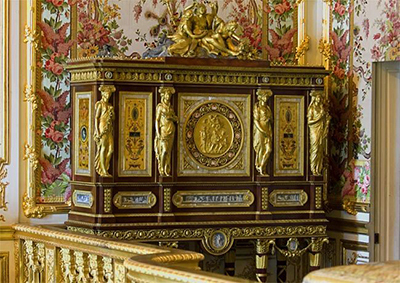 Marie-Antoinette's jewellery cabinet - The jewellery cabinet commissioned to Jean-Ferdinand Schwerdfeger (1734-1818) by Queen Marie-Antoinette placed in the alcove to the left of the bed in her bedrom at Versailles Palace in 1787. Marie Antoinette's jewellery up for auction - "Highlight diamond-and-pearl pendant piece estimated to fetch up to $2m at Sotheby’s auction in Geneva." Master jeweler invents 'unbreakable' porcelain - CNN style. Meghan Markle wears Diana's Asprey ring to her evening reception - "A 'something blue' gift from Prince Harry." Modern Jeweler - "Products and Trends for Jewelery Retailers." National Jeweler - since 1906. "Jewelry Industry News | Precious Metals Market Analysis & Reporting." NEW YORK JEWELRY DIARY - by Clive Kandel. Oscars 2019: Lady Gaga's Priceless 128.54 Carat "Tiffany Diamond" Necklace Was Last Worn by Audrey Hepburn in 1961 - W Magazine. PARURE - a set of various items of matching jewelry, which rose to popularity in 17th century Europe. Peridot - one of the lesser-known gemstones, despite its illustrious history, increasing rarity and lively beauty. Although a quality peridot is a bright shade of light green tinged with yellow, these gems are often mistaken for darker emeralds. 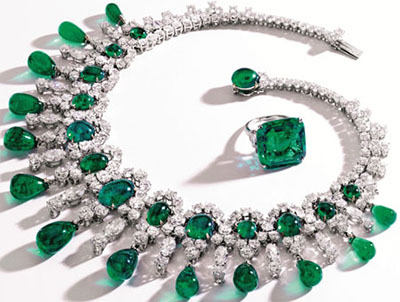 In fact, the Romans called them the “evening emeralds” because of the way they caught and reflected lamplight. PETER CARL FABERGÉ - Russian jeweler, best known for the famous Fabergé eggs, made in the style of genuine Easter eggs, but using precious metals and gemstones rather than more mundane materials. Philippines to auction off $21m worth of Imelda Marcos's jewellery - The Guardian. Polygon - since 1984. Online community and trading network for qualified gem and jewelry professionals. Provides a sophisticated online environment for members to actively interact on the forums, and buy and sell loose diamonds, finished and semi-finished jewelry, precious and semi-precious gemstones, pearls, watches, estate pieces, coins, precious metals and more. Professional Jeweler - "Every article was researched and written by an experienced editorial staff and respected industry authorities covering every aspect of the jewelry industry. The complete collection of informative industry data is available in our archives." Qatari royal showcases jewels of the Maharajas - CNN style. Rapaport Weekly Report - key executive summary, including editorial analysis, news and a comprehensive overview of the diamond and jewelry markets. Delivered to your inbox each week. RHINESTONES - definition & explanation. Resonances de Cartier: eclectic & extraordinary high jewellery that echoes a remarkable past - The Telegraph. 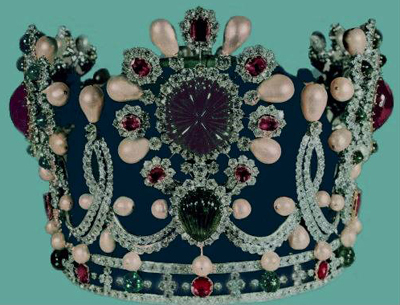 Royal Jewels from the Bourbon Parma Family auction - "Once belonged to Queen Marie Antoinette." Say my name: the return of the statement necklace - The Guardian. spectacular High Jewellery at Paris Haute Couture Week - The Telegraph. Statement Necklace - "Statement necklaces are easy to identify because they're chunky, unique and attention-grabbing. They come in a bevy of styles from metallic necklaces and jeweled pieces to colorful neck pieces and beaded baubles. The most important thing to note is that statement necklaces are meant to be the main, defining piece of your outfit." Suzanne Belperron - (1900–1983). Was an influential 20th-century jewellery designer based in Paris. She worked for the Boivin and Herz jewellery houses before the outbreak of World War II. Belperron had many important clients, from royalty, arts and showbusiness on both sides of the Atlantic. The finest jewellery boxes to store your most precious pieces - The Telegraph. The most incredible bejeweled watches at Paris Couture - The Telegraph. The New Appeal of Men’s Jewelry - The New York Times. Tiffany & Co.: leading the way in ethically produced jewellery - The Telegraph. 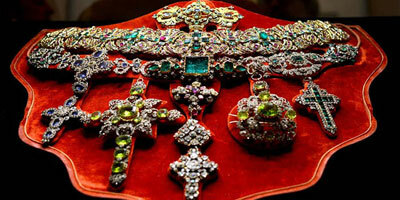 Treasure of San Gennaro - said to rival Britain's Crown Jewels and those of the Russian tsars in value. True lover's knot - the association of knots with the symbolism of love, friendship and affection dates back to antiquity. Vermeil - combination of sterling silver, gold, and other precious metals, commonly used as a component in jewelry. Where do the jewels end up after a heist? - The Telegraph. Why blingier is always better when it comes to jewellery in Hollywood - The Telegraph. ZIRCON - Zircon (ZrSiO4) is cut into gemstones for use in jewelry. Crown Jewels of Major Countries - Business Insider. Crown Jewels of the United Kingdom - at The Tower of London. 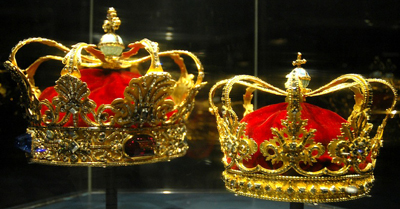 The value of crowns, diadems and various jewels is valued at over 2,5 Billion. Danish Crown Regalia - Wikipedia. 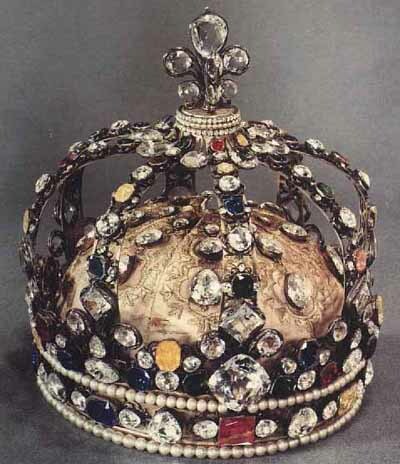 FRENCH CROWN JEWELS - Wikipedia. French Crown Jewels - "Their Sale and Dispersion." Imperial Crown of Mexico - Wikipedia. 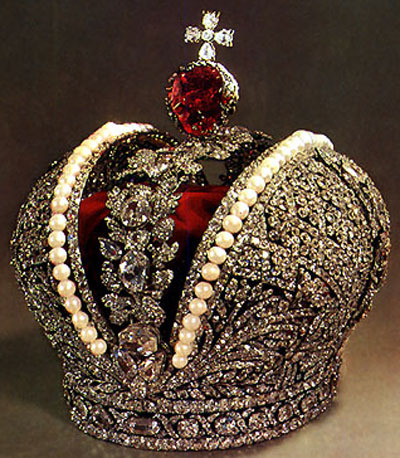 Imperial Crown of Russia - Wikipedia. India to Seek Return of Koh-i-Noor Diamond From Britain - The New York Times. Iranian Crown Jewels - Wikipedia. Iron Crown of Lombardy - Wikipedia. Regalia of the Russian tsars - Wikipedia. 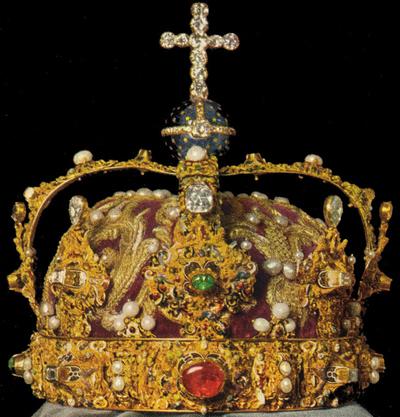 Swedish Crown Regalia - Wikipedia. The Ganoksin project - The Complete Gem and Jewelry Making Information Resource." Features an archive of more than 250,000 technical articles, blogs, instructional videos, networking functions, forums. The Mysterious Disappearance Of The Russian Crown Jewels - "Tracking the Story of the Russian Crown Jewels." Treasury of National Jewels - Central Bank of the Islamic Republic of Iran.